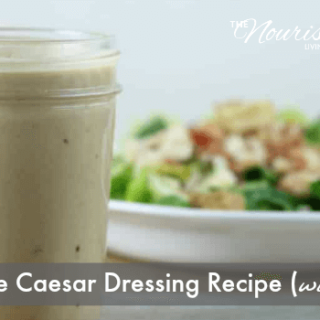 This creamy and delicious homemade Caesar dressing recipe does not have raw eggs in it, but that doesn’t alter the flavor at all. This recipe is SO tasty; once you try this homemade Caesar salad dressing, you’ll never want the store-bought stuff again! I love eating salads in the summer. Starting in about late July, we walk to the garden to “shop” for ingredients for our dinners. I grow lettuce, tomatoes, cucumbers, and green onions that are all wonderful on salads. When it gets really hot out, we don’t have a big dinner. I don’t want to heat up the house cooking, and none of us are really in the mood for a big meal after working all day anyway. I consider a nice Caesar salad a perfect dinner in the summer. We will usually grill marinated chicken one night for dinner and use the leftover chicken on a bed of Romaine with this homemade Caesar dressing. This is the third in my series of homemade salad dressings. Don’t miss my Greek salad dressing recipe and my Italian salad dressing recipe. Most Caesar dressing recipes call for raw eggs. If you’ve ever made your own salad dressing, then you know that the oil and water separate pretty quickly. Caesar dressing has water in the form of lemon juice and half and half, which is a fat. Without the egg, they won’t combine, and you’ll have a mess. People have been eating Caesar salad dressing with raw eggs forever, but I still prefer not to eat raw eggs, even raw eggs from my own flock of chickens. To made an egg-less Caesar salad dressing, I used mayonnaise. Mayonnaise is made with oil and eggs, so it still acts as an emulsifier in this recipe. I buy mayonnaise that is made with olive oil. 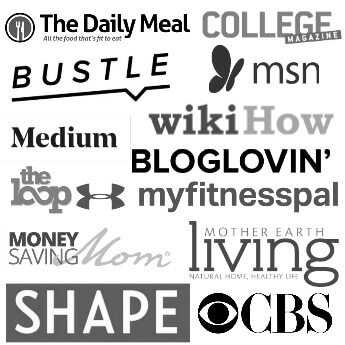 You can use your favorite brand. Don’t worry about this dressing tasting like mayo. I do not eat mayonnaise except when mixed it in things and never on sandwiches or anywhere I would taste the actual taste of the mayo. 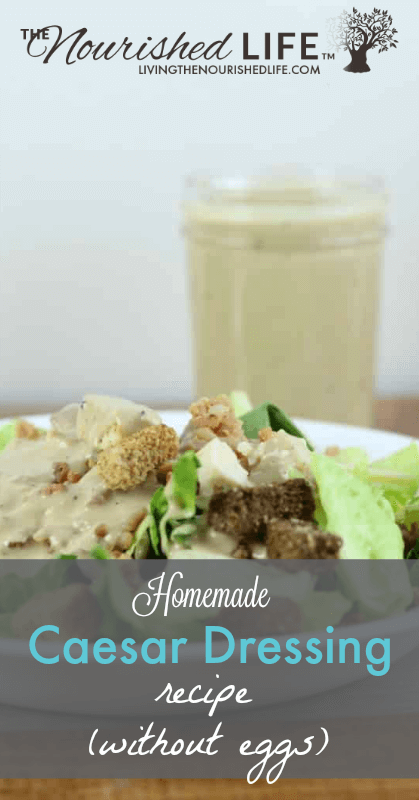 This homemade Caesar salad dressing does not taste like mayo at all! The other crucial ingredient to a good Caesar dressing are the anchovies. They give the dressing that blast of brine and really add a flavor that can’t be substituted for. In this recipe, I used anchovy fillets. You can buy anchovy paste and use that, but the paste is made with the fillet and vinegar, so the briney taste will be milder. 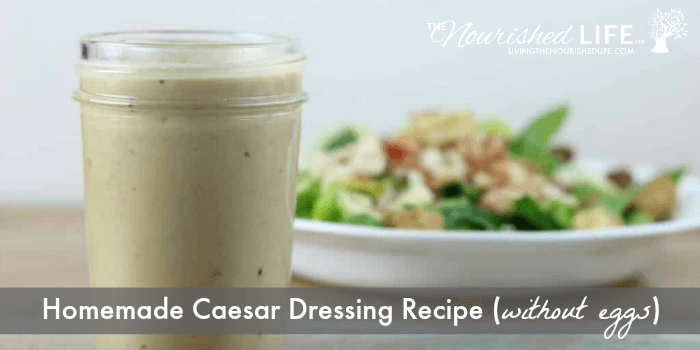 This creamy and delicious Homemade Caesar Dressing recipe uses no raw eggs, but you won't be able to tell, because the taste is so good. In a food processor, combine anchovies and garlic. Pulse until a puree forms. If using anchovy paste, add the paste and garlic and pulse. Add the mayonnaise, Parmesan cheese, half and half, lemon juice, Dijon mustard, and Worcestershire sauce. Process until creamy. Pour into a mason jar or other container. Let sit in the fridge for at least an hour before using. Thanks so much for sharing this recipe. I found that using anchovy paste, rather than whole anchovies, gave my dressing a really smooth and creamy texture. The final result tasted even better than some of the bottled brands I had bought from the grocery store. This recipe is a definite ‘keeper’ for my recipe box. Thanks again!